Join us for a gathering of impact investing professionals, social entrepreneurs, and all others who believe in catalyzing investment capital for environmental, social, and financial impact. 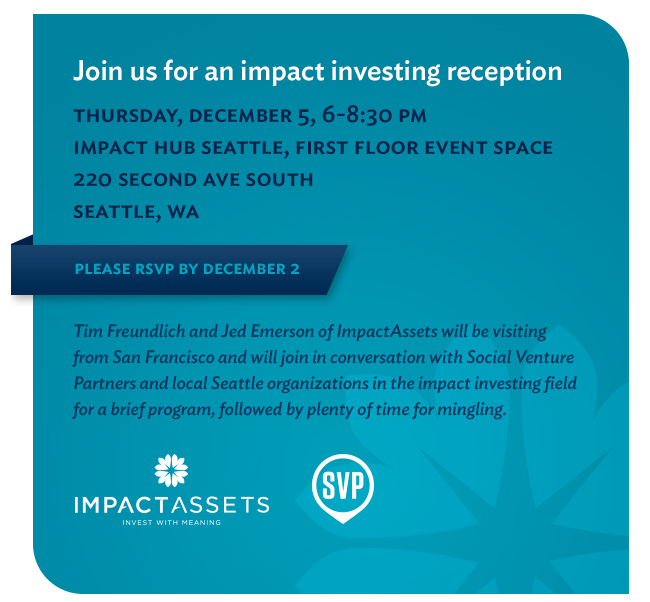 Tim Freundlich and Jed Emerson of ImpactAssets will be visiting from San Francisco and will join in conversation with Social Venture Partners and local Seattle organizations in the impact investing field for a brief program, followed by plenty of time for mingling. 6:30-7:45 Jed Emerson and local Seattle impact organizations will discuss the spectrum and growth of impact investing, supported by tangible examples. This group will represent and share perspectives across the ecosystem of investors, entrepreneurs, and fund managers working to increase the flow of capital towards impact. Introduction by Tim Freundlich, ImpactAssets, and Paul Shoemaker, SVP Seattle. This event is geared toward a general interest audience that includes anyone who wants their money to have a positive impact in the world, whether you are an accredited investor or just want to move your money. We look forward to seeing you this Wednesday and celebrating another great season of change.